Paco Wow Paco, thank you so much, I really appreciate that! I will definitely look into evening out those sizes, I must have missed that..
And, a BIG Thank you for the 9/10, that motivates me to keep pushing even harder. I'll continue to test my FB ads and hopefully make my first sale soon. I appreciate all the help and advice, and I will definitely keep this community updated. Thean please keep us updated! Very thoroughly impressed with your store and excited to hear back about your Facebook ads data. Please do keep us posted about any success or struggles. We've done our fair share of Facebook ads, and would be happy to provide insight wherever possible. I created two ads, a Carousel Slide Show Ad and a Single image ad. Both these ads ran on both these audiences for this period. These ads were optimized for Content Views, and I've edited the placements to show only on the News Feed and Right Column. As you can see, these results were not impressive at all. I still have a budget of $5 per ad, but I realized now that reach and conversion on this budget would be way to low. I can increase it to $10 0r $15 per ad, in order to test it for a few days, but I don't want to waste too much money. I also decided to change to "Slide Show Carousel Ad" to a "Single Image Carousel Ad", I don't know if this will make any difference. I figured that this Carousel ad is best to display a few products instead of just one. This way I can target both men and women, or do you think that this strategy might be wrong. Thank you for offering to help me out! I'm willing to try anything to make this business profitable. skwtayler I thought I'd tag you in this thread. This is my experience and results so far... I'm still learning myself, but I will try to provide value for everyone as far as I go. First of all, wow! I am so incredibly impressed. I have rarely seen someone be so diligent with the resources provided and actually apply them to their marketing plan. It was an absolute treat to go through this! While I don't have an absolute way of knowing the best step forward, I'll do my best to offer some insight. First thing I noticed is that your audiences are a few million people. Most Facebook Ad documentation you will find suggests keeping the audience around 500,000 people. From my experiences, I've found success with around 250,000. 5 million is a little too many for the algorithm to find the right people. Next, I completely appreciate your attempt to bring in engagement first. The only problem is, ads cost a lot of money in the Americas. Here's a hack for you! First, if you're looking for likes for social media, boost a post rather than simply running an ad. The benefit here is that an ad disappears once the campaign is over, but a boosted post stays with the likes and shares on your page. Additionally, every time someone likes the post, you can invite them to like your page (although many do anyways). The real hack, is targeting countries where ads are much cheaper. I would suggest targeting the Philippines for example to get bring in social proof. To give you a personal example, I boosted this post to the Philippines for a total of $10 and it has over 400 likes and my page got 300 likes. Now, I can advertise this post to the United States and Canada with a conversion campaign and all my impressions will see it with a considerable amount of social proof! Also, I think you should keep running carousel ads. The reason being is that in Business Manager you can see a breakdown of how each ad performs. You can cut the images that are not performing as well as the others. Also, try to see if you can find any videos to source for ads. These perform exceptionally well in the algorithm and with customers! Finally, I think you should keep one ad that is retargeting your previous visitors. It's important to remember that on average, customers need to see something 3-7 times before purchasing. Here is some steps I use to create retargeting ads. Whew, okay, I hope that helps a little! Let me know what you think or if you'd like anything cleared up. Happy to discuss Facebook ads until I'm blue in the face. Magda Hi there Magda, thank you so much for your time and insight, it is very helpful indeed! With regards to my budget, and the estimate reach and conversions, I've noticed that it's extremely low. As you can see, with a $10 budget, the estimate shows a reach of between 160-920, but no conversions. When I bring it up to $50 per day, the reach goes up to between 850 - 3800, and I at least see a conversion estimate of between 14 - 52, which is also extremely low for a budget of $50 per day. This will exhaust my entire budget within a week. Does this seem right? Am I perhaps missing something or doing something wrong? Thanks for the update! Nope, you're not doing anything wrong from what I can see. Unfortunately, the "projected" conversions will be zero for ads with less than $20 a day (from my experiences). I've absolutely gotten sales with $5 ads, but that projection still said 0. There no easy answer for this, as normally when you're getting started you are purchasing data essentially. 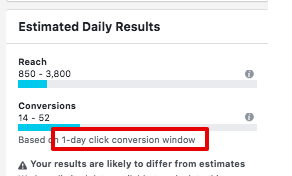 However, what I can suggest is making sure your conversion window is 7-days rather than 1-day. 1-day only optimizes the ads for those who might purchase after one click, which is very few people! Honestly, in this situation you will need to decide whether you're going to keep mining for data or consider another advertising method. Normally the first few weeks you want to run as many separate ad sets as possible with a small budget to see what's working and what's not. Testing requires investment with Facebook ads before you can continue. However, this reach is still looking quite low. I would suggest trying out different audiences and simply seeing what the estimated reach will be. Hopefully that will offer some better options to try. Hope that helps add some insight. I think you're absolutely on the right track, but with Facebook Ads you really need to keep testing and pushing! Magda So, while I was waiting for your reply, I've decided to give Google ads a try... I started two ads Last week Thursday and BOOOOOOM!!!! A few hours ago I received my very first order! ($59,99) So excited! The order came from CA, USA through Google... I have a 25% discount posted all over my shop and they didn't even use it. I'm going re-think my Target Audience with FB ads to see if I can get those numbers up! Thank you so much for all the insight you've provided so far, I really do appreciate it! I have learned from your journey. Well done. Zitel Happy to hear that! We all need to post our journeys, I believe we could all learn from each other! Good luck with the rest of your journey! I am so happy we can be here to celebrate that first win with you. You will never forget your first sale because it really proves, it's possible! Also, I am so happy to hear you decide to give Google Ads a try. I've seen a growing number of instances recently where merchants saw sales after looking into a new advertising platform. Please keep us updated. Here's to a 100 more! Woohoo! So excited to hear that the sales have begun to roll. Look out for Woodster y'all -- Coming to a Facebook feed near you!! GREAT WORK and please keep us all posted on your successes. Paco Thanks Paco, and a HUGE thank you for all your advice and guidance. Appreciate it tremendously! Thought I'd just post an update quickly. I found someone to assist me with my FB ads, and hopefully, I'll have some feedback within the next week or so. So far I've generated 3 sales over the past 2,5 weeks, all from the Google Shopping app in Shopify. Even though I'm extremely grateful for the sales, I'm still not happy with the results. I'm currently busy analyzing the data to see how and where I can improve. With 202 Clicks. That's a ratio of 1:67. According to Shopify statistics, my total ad spend to date is $97.14 and total sales are $145.98. My campaign is earning $1.50 in sales on every $1.00 spent on shopping ads. I did create another campaign in my Google Ads account, which I have spent about $100 on, but as I've said, all the sales came from the Google Shopping Campaign. My giveaway valued at $185 will only cost me $70. This means that I paid $0,05 USD per email address. Even though no sales resulted from this, the objective was to get email addresses for Email marketing and retargeting. So with this, I'm very pleased. I'll keep you posted on any further results/findings. Such a pleasure to hear from you, thank you for the update! Although you're not making as many sales as you'd like to yet, it's clear you're certainly on your path there. With more social proof, emails collected, and help with Facebook Ads, you're sure to be bringing more in over time. Your biggest win so far is being in the positives with regards to ad spend. Many merchants have to dig deep in the negatives before they start making it back! Similar to @Pristine I'd love to know what giveaway app or feature you're using. How did you find out about it? What led you to use it instead of running a manual one on a social media page? My other question and interest, please let us know what changes your FB Ads help suggest! I'm eagerly looking forward to your results but also about learning what change made them happen. Hi @Thean how do the give always work? How many winners and how do you pick a winner. What email host and giver 'announcer' do you use? Do you also advertise the give away? It's actually very easy. I used KingSumo (https://kingsumo.com/) for my Giveaway. It's straightforward, just follow the steps. I only had 1 winner, and I integrated my MailChimp account to collect the email addresses for further marketing purposes. At the end of the competition, the winner is chosen by random selection via KingSumo, after which you will need to notify the winner. If for some reason the winner does not respond, or cannot accept the prize for whatever reason, you can redraw. With regards to promoting the giveaway, I shared the Giveaway via KingSumo on my personal Facebook Page, my Facebook business page, Business Twitter Account, and Business Instagram Account, using relevant #'s. I did this once a week for 4 weeks. I didn't spend any money advertising the Giveaway. Hi Magda always a pleasure hearing from you as well. Thank you for your kind words, always appreciated. With regards to the giveaway and the tools I used, please see my reply to Pristine. I came across KingSumo when I followed the case study by Tim Kock on Oberlo's blog (https://www.oberlo.com/blog/made-8873-selling-sunglasses?utm_source=mailchimp&utm_medium=email&utm_campaign=plain-text&utm_content=13Aug18-made-8873-selling-sunglasses). With regards to my FB ads, I employed a gentleman that specializes in Social Media & Digital Marketing last week, who seemed to know what he was doing. He started to run ads last week Monday and according to my knowledge, these ads were set up to collect data. He adjusted the ads accordingly and informed me that we should start seeing sales this week. I will keep you posted.